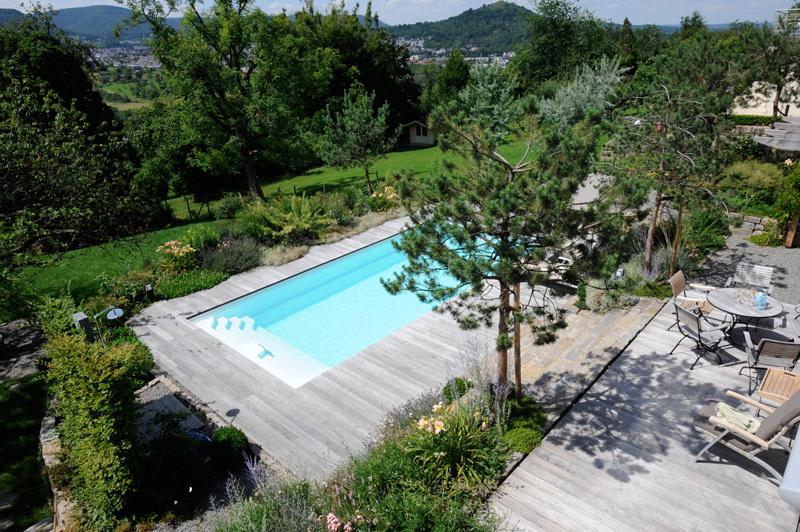 A panoramic view, luscious green, a warm wood patio – this unpretentious and modern pool is perfectly integrated in its environment in the garden of a modern family home. The harmonious interaction of the elements guarantees a familial and cosy atmosphere. Leave your everyday cares behind and swim as long as you like with the counter current unit. Or use the pool's special massage function. In addition to the solar cover, which both heats the pool and disappears into the pool wall when not required, the natural pool design stands out thanks to the combination of feel-good factors and functionality.